Qi is often translated as "energy." But it is better understood by knowing and experiencing what it does and how it functions in man, and on the earth, and in the entire universe. In English it is written as "qi" or "chi" or "ch'i," and pronounced as "chee." In Chinese it is 气 in its modern "Simplified" character; and 氣 in its "Traditional" form. In Mandarin, the standard spoken language of China today, the pronunciation starts high and drops sharply in pitch and tone, chee. In the Cantonese dialect—still widely used in southern China and in Chinese communities throughout the world—it is hei; and said as "hay" in a vocal middle pitch with slight rise at the end. The related Japanese word, Ki, uses a similar character 気 and has similar extended meanings. Also related is Prana, the "vital energy" of the spiritual and healing systems of India. But Chinese is not as straightforward: Reverso Online Dictionary Chinese-English English-Chinese gives over 178 contemporary meanings of qi used alone and in compound words. But it is possible to gain an understanding that leads to a consciously aware experiencing of qi—at least in many of its manifestations. Then with some applied work—"gong" in Chinese—qi can be used in a multitude of ways to gain the other basic meaning of "gong": accomplishment. Accomplishment in areas as seemingly disparate as gaining Daoist Immortality - to gaining proficiency in the sexual bedroom arts. From gaining skills in the martial arts to defend, even easily kill others— to gaining skills through qigong and Traditional Chinese Medicine to heal the self and to heal others. Huangdi (Huang-di) (Huang-ti) (known as the Yellow Emperor). One of the earliest legendary Chinese rulers. Certain myths have him as one of the founders of Taoism. He is also said to be the author of the Yellow Emperor's Canon of Internal Medicine, the first medical treatise in the history of China. Furthermore Huang-di is credited with the creation of mankind, the invention of writing, the compass, the pottery wheel, and his wife with the breeding of silkworms. Dao De Jing - (Tao Te Ching) ("Way of Strength/Virtue, Scripture"), by Lao Zi (Lao Tzu). A basic text of Daoism (Taoism). Jade Pendant Inscription, Xing qi ming. 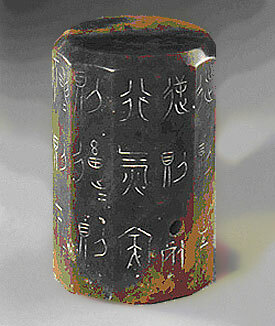 A small twelve surfaced jade cylinder with forty-five carved Chinese words: "With relaxed concentration, inhale deeply, calmly. Direct the qi (as) breath downwards. In quiet it will accumulate and solidify. Then as you exhale, it will sprout upwards, growing to the upper regions. (with such controlled breathing) press it up to the crown of the head; press it down through the whole body. Following this practice brings life. Acting contrary to this brings death." The book Zhuangzi (Chuang-Tzu), titled after its author, is a classic of mystical Daoism and of allegorical fiction. For millennia, it has been a favorite of Chinese intellectuals, poets, and artists. "Unify your attention. Do not listen with the ears, listen with the mind. Do not listen with the mind but listen with the vital breath (qi). The ears only listen to sounds. The mind is only aware of its objects. But to focus on the vital breath is to be empty and await the arising of objects." (from chapter 4). Qi is a Chinese word meaning "vital energy flow." It is the essence of life, as well as the core of consciousness. All persons, places and things emanate qi. All movement--or potential movement--is caused and controlled by qi. In living beings qi forms itself into thoughts, emotions and passions. All physical and mental activities are manifestations of qi: sensing, right and left brain cogitating, emotions, as well as all body processes such as breathing, digestion, and procreation. Each of us are made from qi. We bring it into our bodies, are nourished by it, transform it; and transmit and project it.